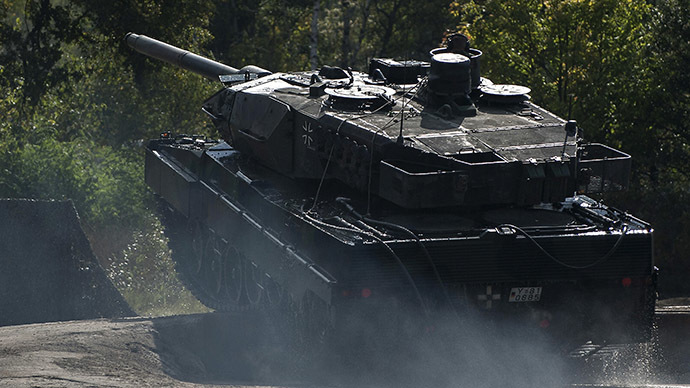 Germany has stopped arms exports to one of its biggest buyers, Saudi Arabia. The instability in the region led Chancellor Angela Merkel and her ministers to take the decision. The information hasn’t been officially confirmed. According to the Bild newspaper, weapons orders from the Middle Eastern country have either been “rejected, pure and simple,” or they have been deferred for further consideration. The decision was made by Germany’s Security Council on Wednesday, which includes Merkel, Vice Chancellor Sigmar Gabriel and seven other ministers. "According to government sources, the situation in the region is too unstable to ship arms there," despite the fact that Saudi Arabia is "one of the most important clients of Germany's arms industry," with €360 million ($400 million) of arms shipments authorized in 2013, Bild added. The talks between Merkel and the ministers were held in secret and the government said it won’t comment on the allegations. The German daily says the decision was made due to instability in the Middle East as Berlin fears that arms supplied to Saudi Arabia could be used by terrorists in the region in the future xIn October, the National Security Council approved the export of weapons to the Middle Eastern country, which included tanks and machine guns. The decision, which was approved by Merkel and the foreign, defense and development ministers, also included six weapons systems for testing and electronic surveillance for Saudi Arabia. The news came in stark contrast to a May decision that turned down two thirds of all arms export licenses to the country. The move to halt arms exports is likely to prove popular amongst the German population, with many of the public condemning the oil rich nation for its poor human rights record. A survey carried out for Bild found that 78 percent of Germans say Berlin should stop selling arms to the Kingdom, while a further 60 percent said that Germany should break off all trade to Saudi Arabia due to numerous human rights violations there. Defense companies employ 80,000 people in Germany, which from 2008-2012 was the world’s third largest exporter of arms after America and Russia, according to the Stockholm International Peace Research Institute. In 2013, Germany sold €5.8 billion (US$7.2 billion) worth of arms, 62 percent of which was sent to non-NATO states with dubious human rights records, such as Saudi Arabia and Algeria. It is not known whether the decision by the German government has anything to do with the death of King Abdullah. Unlike Britain and France, who sent their national leaders to his funeral in Riyadh, Germany elected to send former President Christian Wulff as its representative.